Find tasty and healthy certified organic Canadian cheeses from environmentally-friendly farms. They are simply delicious and are sure to add a distinctive touch to all your gourmet dishes and healthy meals. Not only is organic food better for you—it also tastes fantastic! Our Canadian butters and cheeses offer you a whole new world of flavour. Choosing organic foods means savouring life to the fullest! View product Frugal 7% M.F. Partially Skimmed Mozzarella 15% M.F. View product Partially Skimmed Mozzarella 15% M.F. Sliced Partially Skimmed Mozzarella 15% M.F. View product Sliced Partially Skimmed Mozzarella 15% M.F. View product Mozzarella 20% M.F. Every bite is a better world. 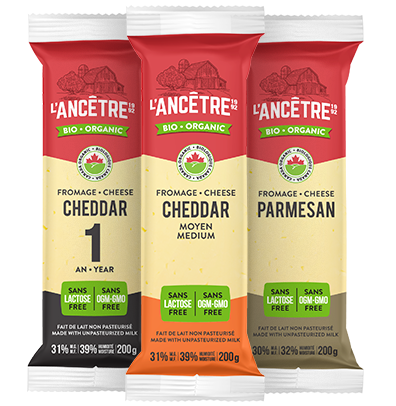 L’Ancêtre Cheese Factory is proud to offer authentic organic cheeses and butters!